I was fiddling around last night in DAZ Studio with Victoria 4 and groaning about the evil joints when it occurred to me that *gasps* we have Smoothing in DS4+ so I went and wrote up a short tutorial on how to apply smoothing to figures and items that don't have it. If you are tired of seeing the evil joints on your Figures (ahem ... V4's thighs and shoulders ... *shudders*) you can use the Smoothing in DAZ Studio 4+ to remedy this. It's quick and easy to use and pretty much ANYTHING can have smoothing applied to it! 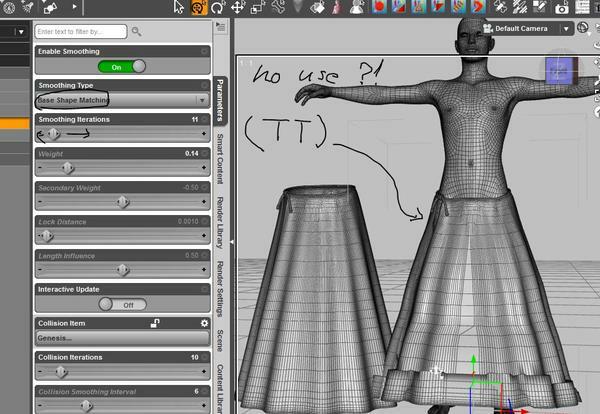 First you need to load your figure into the scene. I'm using Victoria 4.2 for the purposes of this tutorial. If Figure doesn't work for you try "Object"
This will apply the modifier to your figure ... see it really is painless! Turns it OFF or ON depending on your needs. 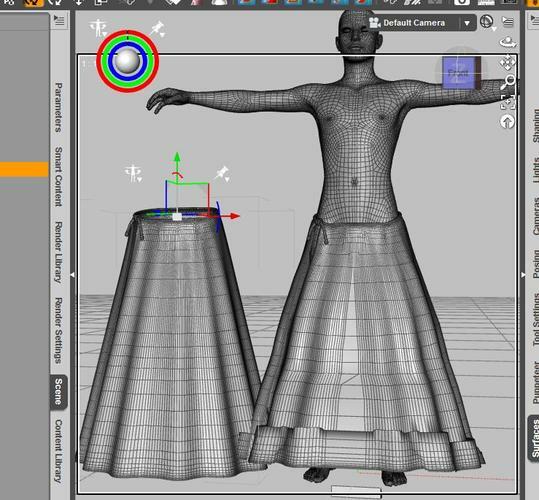 Base Shape Matching - This will use your figures base shape as the model for how it will smooth. This is great for softer feeling figures/characters or figures you notice have hard edges where you want them smooth. Generic - This will do minimal smoothing but is great for figures with morphs on them with lots of detail. An example would be the Morphs++ Muscular type morphs for V4, where Base Shape Matching will smooth them out some the Generic option will not but you will still get some joint smoothing just not as much as with the Base Shape Matching. This is what tells DAZ Studio just how much to smooth your figure/prop. The higher the Iteration the more smoothing you get BUT this will become resource intensive the higher you raise the number, especially if you have more than a few smoothed items in your scene! This allows your smoothing to auto-correct as you pose or move your figure. It can be VERY VERY resource intensive so I leave this set to OFF. Your figure will still smooth without it on after you are done moving it so I don't' bother with this one at all. This is where you tell DAZ Studio exactly what you want your figure/prop to collide with. So if you have a layered outfit you can set the outer item like a jacket to collide with the shirt underneath it and not have to worry about Poke-Through. I don't notice much of a difference using this dial so I just leave it set to the default 3 iterations and call it done. If you notice your Smoothing is not working as it should, or not working at all, but your settings are all on and correct try turning Smoothing Off via the Enable Smoothing Section and then turning it back On and this should fix the problem! Another quick fix to this is to just to a quick Hide/Show of the figure or item via the "Eyeball" icon in your Scene Tab! Hope you guys find this helpful! Thank you for this tutorial, Elliandra. still, ive have problems with stokings, tights, but ive posted it in other post. the Message i get "cannot locate file for runtime textures"
Oups , how do i do that? but some things Don't go. even if i selct them over and over again. It sounds like there is some pad pathing in the material files you are trying to load. To correct this you will need a text editor. Try to apply the material in DAZ Studio as it will give you the full path in the error window that pops up. Navigate to the path the box shows you and check to see if the texture map is there and named correctly. From here it's just a matter of making sure that the texture map path for the material matches the actual path in the material file. "/Runtime/Textures/the rest of the pathing here"
":Runtime:Textures:the rest of the pathing here"
If you can toss up a link to the product page I can take a look at the files if I have them on my system. Also if a product is throwing pathing errors for you a lot of times the vendors are really great about getting fixes for us! If this doesn't help please let me know! i wanted to say thank you for your kind offer to help. i downloaded so many things, i was not sure where it came from, i was sure it was a DAZ item. it came from sharecg, it may work in poser quite well, but for some reason, DaZ has problems with it, it looks like something is not quite right with it. and Deni who made it, also must know by now it's not right. in Daz. she said she used : Tabbycat, Melite hair from Plus3d , Mairy from Renderosity. she said it works in Daz. but it looks like other DAZ users had the same problem like me. i tried removing the ...... ! ........., but did not work. i thought i should post this in the hope it will help anyone who has the same problems. 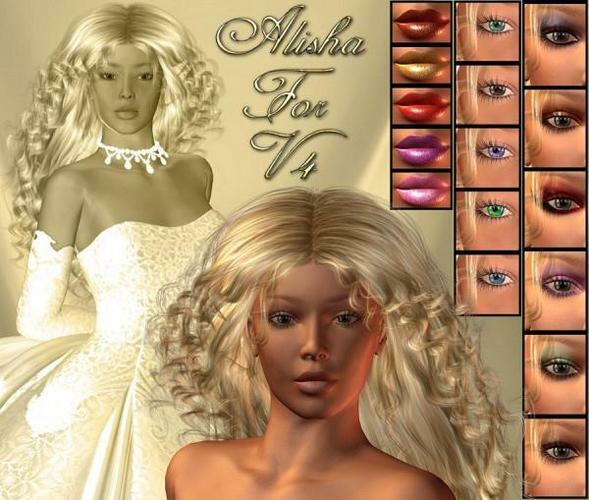 You need to make a new folder in Textures named !Alisha and copy the contents of the folder Alisha into it. Then the file will find the textures. That's what I have done and it works. I simply renamed the folder with mark ( ! ) begining of the name. this is the result Elliandra, i'm so pleased i wanted to show you what i've been working on. alisa body textures and eyes makup lips . alysha Hair. and a few other things..
then,,, I am exciting about Smoothing Type -Generic. or used transfer utlity rigged clothings for genesis . 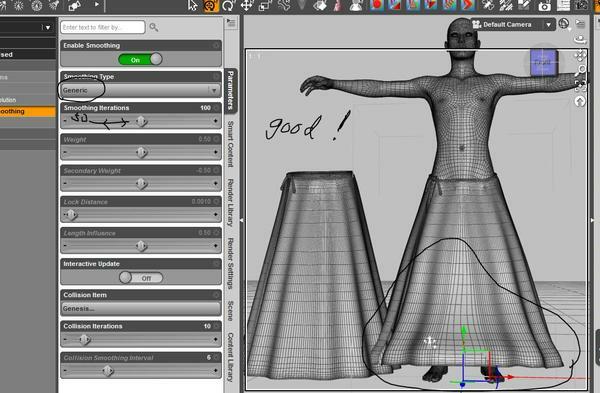 but now apply smoothing modifier on auto-fit clothing. 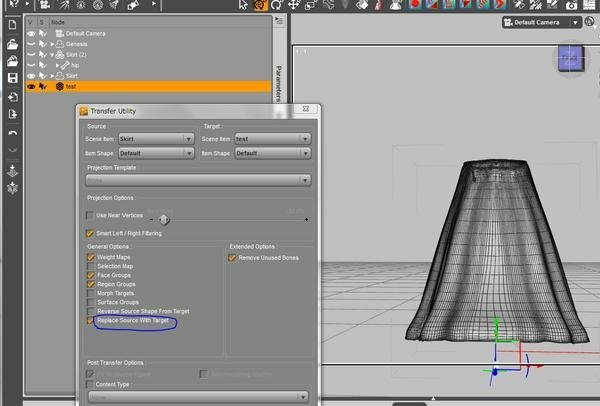 if you try by Smoothing type set "Base shape ", you may not remove these breaked mesh shape. now ,, it is easy to adjust the shape by other modelor. then improt the obj again. after that use transfer utiltiy. set auto fitted clothing or genesis, as source,, then set the improted obj as target. then,, , save as new figure and prop. now the skirt for V4 change ,,skirt for genesis. Glad I could help out guys! Bumping an old topic here! But, can I say this is perfect! I feel quite ashamed to admit that despite using DAZ for over a year now, I never considered applying smoothing to the actual M4 figure! Whether or not I assumed that DAZ was giving me the best finish already I cannot say. However, I will need to go back to your little tutorial and experiment, because at present I do appear to be having an issue with the eyes both on or off? I will have to go away and have a mess about with dials! What issue are you having with the eyes?